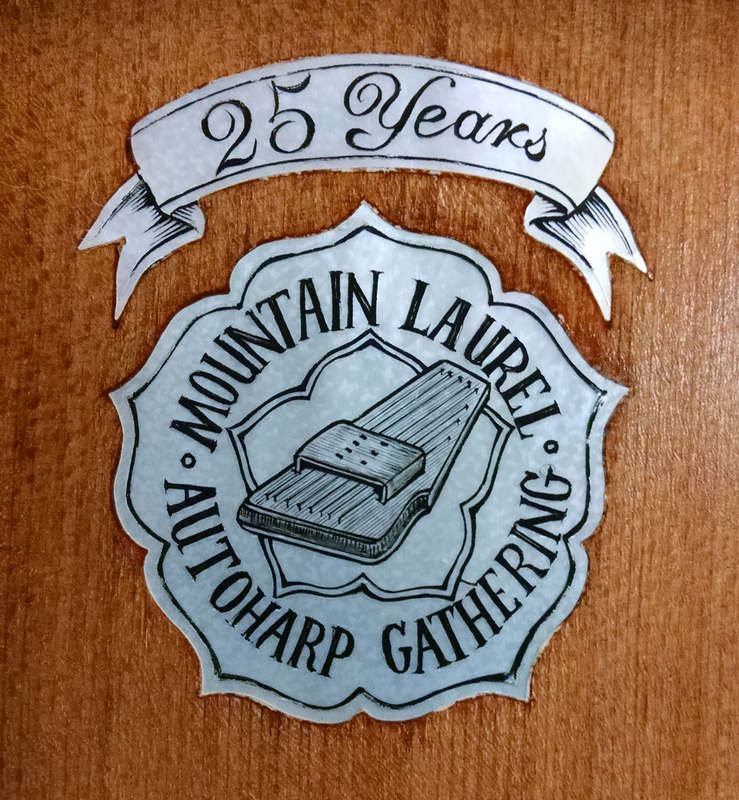 2015 marks the Mountain Laurel Autoharp’s Championship’s 25th anniversary, making it a special occasion beyond its quarter-century status. Like the 20th Championship in 2010, past Champions would be sure to enter, making it a superior competition. 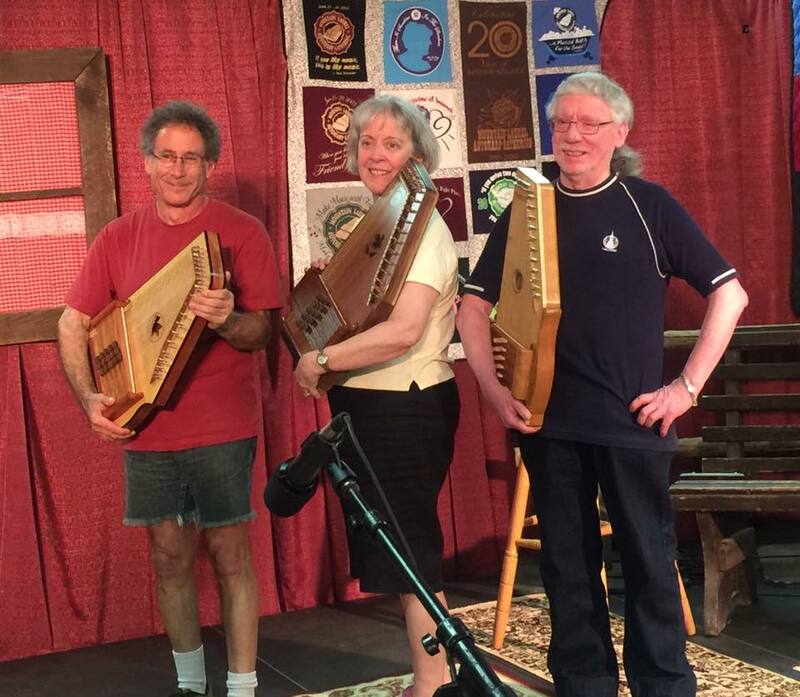 But this time, among the prize autoharps for 1st, 2nd and 3rd place would be a 25th Anniversary Commemorative Autoharp, collaborated by luthiers Dr. George Orthey (using his design), Tom Fladmark, John Hollandsworth and Greg Schreiber, with mother-of-pearl inlay executed by Glenn Carson. On the flip side, I considered the good that entering would do. I would honor the 25th Annual Championship by participating. This felt right, especially as the Contest Manager encouraged all past Champions to enter. 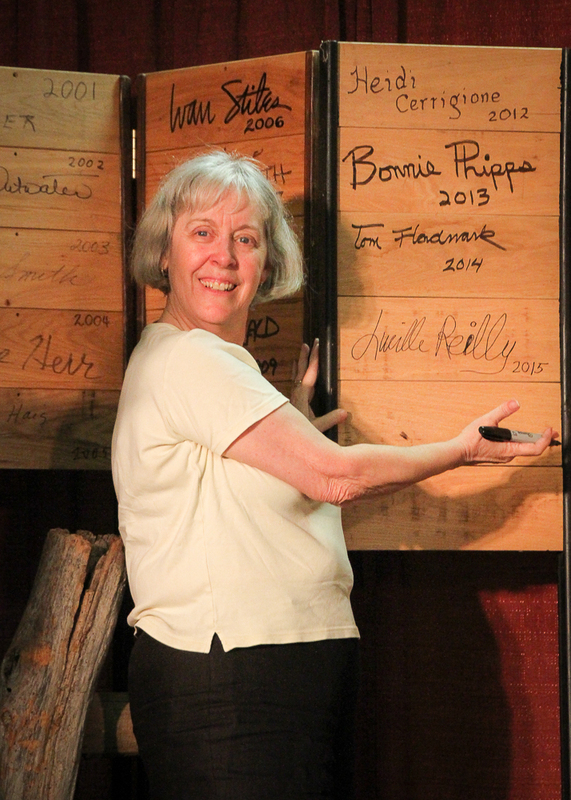 Then 2013 Champion Bonnie Phipps made this comment to me months before on the phone: “Let’s give them a good show.” Yes, the audience always needs that. In 2010, jaws were on the floor as MLAG attendees heard autoharping reminiscent of contests in the mid-1990s. It would be good to recreate the same magic this year. And finally, this is the contest a past Champion needs to compete in! A sole past Champion competing and winning in an “off” year might make the contest seem too easy. If a past Champion is going to win, the competition had better be tough. Despite the good aspects, I still struggled. I didn’t want to come across as being greedy; in fact, my thoughts were necessarily far from this place. I am too aware that winning a Championship can be anyone’s game. Winning in the past does not guarantee winning again, making this contest all the harder for those of us who have won it before. It was far more interesting to imagine a “complete unknown” showing up and running away with the gold. Now that would be an exciting wrinkle even I would welcome! Last of all, while any contestant would be happy winning once, a contest can never be about “giving someone else a turn.” It always has to be about musical excellence and envelope-pushing on the focus instrument. My participation would help maintain the Championship’s credibility along these lines, no matter what the outcome. With all of this in mind, I decided to go ahead and prepare five tunes (the necessary four, plus one in case of a tie) while making up my mind. No commitment would need to be made until MLAG began, two days before the contest. Two of the tunes were my final-round selections for the 1995 International Autoharp Championship, which I won that year. Both tunes were strong in 1995, and because the first hurdle of any contest is ensuring advancement to the final round of five contestants, I hoped by playing them in the preliminary round this time that they would comprise a standout performance. Plus, with them, I would remember my “Autoharp Mother,” the late Mary Lou Orthey. The third tune came from my forthcoming CD, to be released the day after the contest. This was my last chance to compete with it before it became a known entity. These three tunes were easy to practice, already being committed to memory, although the two 1995 tunes were rusty and needed extra attention at slow speeds. A metronome proved helpful at times to steady tempos and fingers. But why did the lower edge of the pick on my middle finger catch on a string and go flying, twice? That would be a disaster in the contest! Once at MLAG, I found the reason: my thumb pick’s tip had ground down 1/8 inch shorter than when it was new, flattening my string hand over the strings. Time for a replacement. As for the fourth tune, I found myself caught up with closet full of clothes and nothing to wear. I wanted a new tune. (OK, it’s a girl thing.) I perused my jigs folder in the file cabinet and “went shopping,” setting aside about a dozen promising jigs. On May 21, while waiting for a B&B student to arrive, I played through the batch. One jig, “Wild Geese,” sang and sang all over the autoharp and made me feel joyful and lighthearted. Done. Over the next 2½ weeks, this wonderful jig refused to transform into an arrangement. Ugh! On Tuesday, June 9, four days before my two-week pre-contest deadline, all I could do was play the tune as is. The arranging process had to hustle: Over the next two days, I devised viable melodic ideas during my daily two-mile speed-walk. They were fine, but the tune needed yet something more. At two days before deadline, I returned home from speed-walking empty-eared. During a quiet moment over breakfast, a tiny harmonic idea came to mind that cracked the arrangement open. Forget breakfast; get out the autoharp! Yes, this idea was wonderful, but after practicing it enough to plug it into the whole, my favorite melodic variation no longer fit. What to do? I threw it out (yes!) and created a new variation that linked the entire arrangement into a seamless whole. This left just one day to play and massage my œuvre to be sure it pleased my ear and felt satisfying. At last. Now I could simply rehearse “Wild Geese” over the next two weeks before the contest, glad that the drama of a rush job was over. Back to soggy cereal. There remained one lingering concern: I always like to “break in” a new contest tune in front of an audience, because attentive, listening ears add another level of complication in performance. How to do that at the last minute? I took my autoharp to church on Sunday, June 14 and asked the minister if I might play one tune during coffee hour between services. Permission granted, everyone at coffee hour liked “Wild Geese” so much that they asked me to play it for the postlude at the end of the second service! (It hardly bears a liturgical title, but I am grateful to the organist for flexing that day.) Then on Monday I met with student Ken Sluce in Australia via webcam to play all of my contest tunes for perhaps the most savvy critic of all. Now “Wild Geese” is ready. They reminded me that I have a God-given gift that needs to be shared. Reason #2 was compelling. If the Championship would be my only performance opportunity during the Gathering, then I needed to enter to return and express the gift. 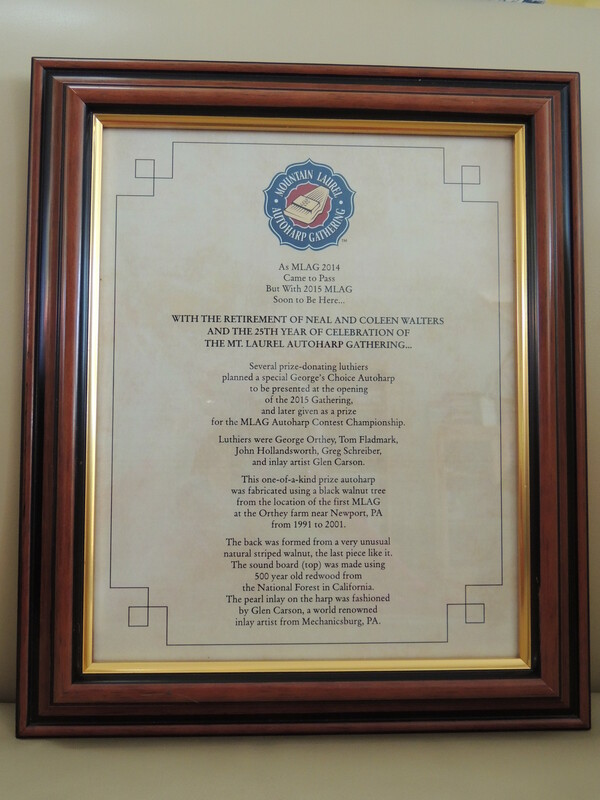 On June 16, I left Denver for MLAG, a day earlier than planned. Hurricane Bill was expected to dump a lot of rain over a good chunk of my route. It was imperative to get ahead of it. I would not win the Championship. Who would win among those likely to enter. A promise to be happy with the outcome, even if I didn’t make the final round (to those of you who have heard me play even a little, this may seem absurd, but again, there are no guarantees). The rest of the time (quite a bit, in fact), I “performed” my contest tunes in my mind with both hands on the steering wheel, the only way to practice them for three days. Once at the home of an autoharp friend in western Pennsylvania for respite, fingers and autoharp were reunited for a few more days of live rehearsal until the time came to move on to the festival site. Entering the Championship is tricky for me in particular, because other contestants tend to draw lines in the sand: any other major contender who enters is okay, while I am perceived as THE threat. As a few autoharpists over the years have said to me, “if I can’t win, I won’t enter” (yikes! ), I waited until the 11th hour to enter the 2010 Championship so as not to derail the number of entrants. (At that time, the sign-up clipboard was in public view; nowadays it is concealed.) If I entered too soon, it was possible that no one else would sign up after me. I had to ensure that the 2010 contest would be exciting by the sheer number of contestants, and it was, with 24 in the preliminary round that year. Here in 2015, one of my autoharp friends came to the rescue by picking up an entry form and delivering it to our campsite. This friend then submitted my completed form well before the registration deadline. All I had to do in a quiet moment was confirm with the person collecting the forms that mine was in the pile; no one saw paper exchange between our hands. Relief. In the meantime, I dodged queries about entering whenever asked, saying I wasn’t sure and was still thinking about it. Practicing onsite presented additional challenges. Daily, keep-the-tunes-in-shape sessions needed to be inaudible. Diane Mann, with whom I camped, stayed outside her rig while I practiced inside with doors and windows closed. During one session, bless her heart, she steered a contestant away from the rig who had stopped by to visit. Thirty minutes before the contest, all was revealed when I showed up for final instructions modestly dressed (anything more felt like a jinx, I just needed to look good enough for potential photo shoots), with autoharps in tow. Number of contestants who were past Champions: Six: Karla Armstrong, George Haig, Mike Herr, Bonnie Phipps, Ivan Stiles and myself. Of those, Mike Herr and I had won this Championship twice. Rules read to all contestants, pulling numbers for performance order was next. I drew #5 from the basket. Although I am often perceived as having nerves of steel, sure, I was nervous. After all, being in this Championship was either a very smart or a very dumb thing to do. The expectations felt higher because of my two past wins. Still, I held fast to the notion that however things turned out, it would be OK.
Now on stage and beginning “Rory O’More,” nervousness held on, until my eyes glanced upon a young woman in the front row who was dancing in her chair and grinning from ear to ear. Every now and then I caught her eye again for an energy boost. She clothed herself in my wavelength and reflected it back. What an affirmation! “Rickett’s Hornpipe” went fine, generating cheers alongside applause. (Cheers aren’t everything: the judges need to judge the quality of the music, not the audience response. The audience is deeply influenced by seeing each contestant, an “advantage” the judges don’t have.) We’d see. Listening to all the contestants, I joined the audience in trying to decide which five would play again in the final round. It was hard to choose. Preliminaries over, the waiting period commenced to tabulate scores. In time, the MC appeared and announced the numbers: 1, 5, 11, 14 and 17. I was IN. I entered the backstage area, stunned to be among the top five to play again, joining George Haig, Cindy Harris, Ricky Levitan and Bonnie Phipps. We drew numbers for a new performance order; mine was #3. I left the building to reset fingerpicks and play a quick warm-up outside. A couple chords in one of the tunes had wandered from memory and needed a jog. Ah, got them. Now in the final round and sitting backstage while #2 played, I was awed by the layers of sound I heard without also seeing the contestant, a true judges’ experience. It is harder to assess Championship playing when the contestant is seen, but this I tried to do throughout the final round, to get a sense for who the top three might be. This would be another hard decision. When it was my turn, I set up and then glanced in the direction of the smiling, dancing little lady in the front row. She was gone! (Hmmm, was she an angel?) A little shaken, I remembered Zechariah 4:6 : “…Not by might, nor by power, but by my Spirit, says the Lord of hosts.” Each tune’s story poured forth. The final round soon over, we waited again for scores to be tabulated. I sat in the back of the hall with picks still on my fingers until it was certain there wouldn’t be a tie-breaker round (I was involved in a tie in 1993; please, please let’s not go there). The MC soon appeared with three numbers: 2, 3 and 5. The contest was over. I removed my picks and hip pouch and headed backstage to face the music. I was the first to reach the backstage area, even more stunned than before the final round. Then George and Ricky walked in. For the first time all evening, I wondered…. We three congratulated each other before the fact while the luthiers set up their prize autoharps for our choosing. If ever there was a time to sing the “Final Jeopardy” jingle, it was now, but I was coming down with a nasty cold and could barely talk, let alone sing. His words took a moment to sink in. Then: WHAT? 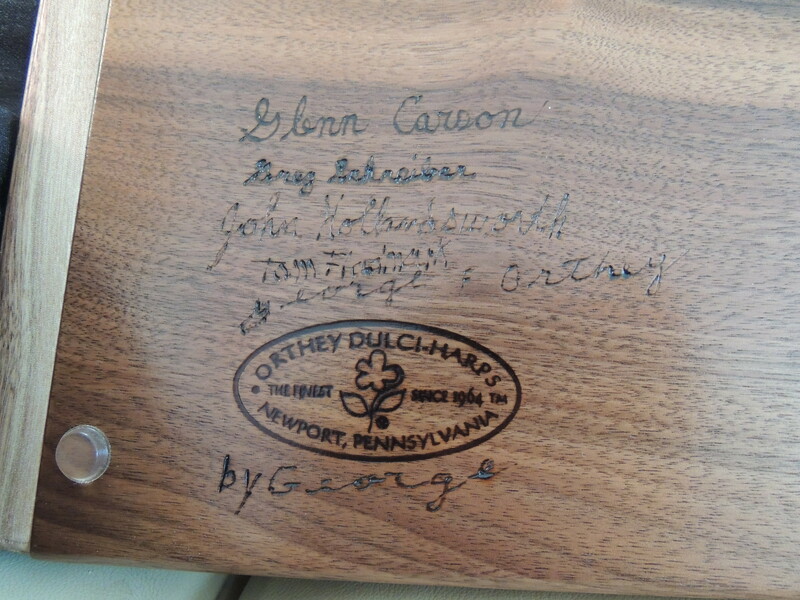 I made a beeline for Neal and gave him a hug, then pointed to George Orthey’s Commemorative Autoharp as my prize. While George Haig in second place chose his autoharp, and Ricky received the remaining one, I strolled about and shook my head in disbelief, hugging Coleen, Maggie, Kathie, Tom (also the 2014 Champion) and John (also the 1991 Champion). I had it all figured out that this wasn’t going to happen, yet here I was, the first three-time winner of the Mountain Laurel Autoharp Championship! Unbelievable. And historic. It takes a while for the audience to learn the results, because the finalists are introduced from last to first. When it was my turn to be introduced, George Orthey, in the photo at right, gave such a long speech beforehand that I wasn’t sure he would remember that I was backstage waiting! You can hear my “acceptance speech” towards the end of this video featuring snippets of all the contestants playing. 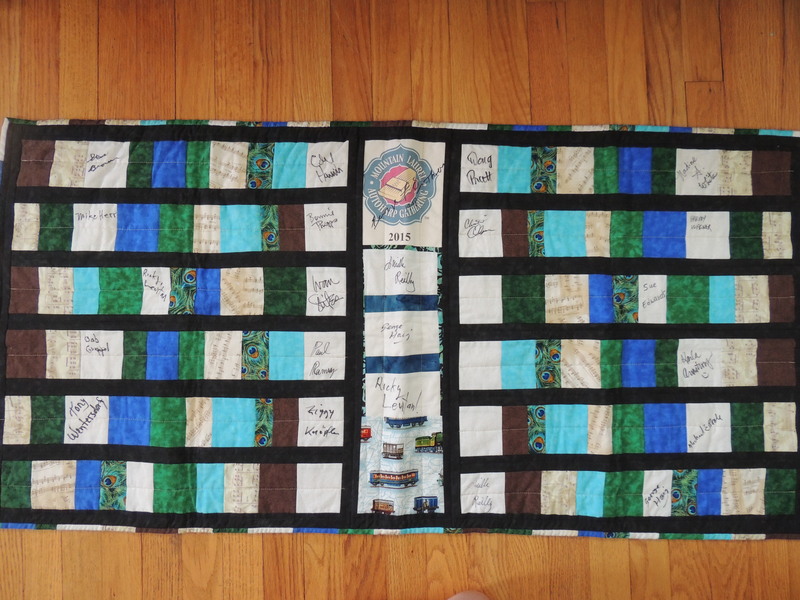 Here is the Commemorative Autoharp: front, back, the mother-of-pearl inlay on the soundboard and the luthiers’ signatures. About the inlay photo: Notice that there are no strings! 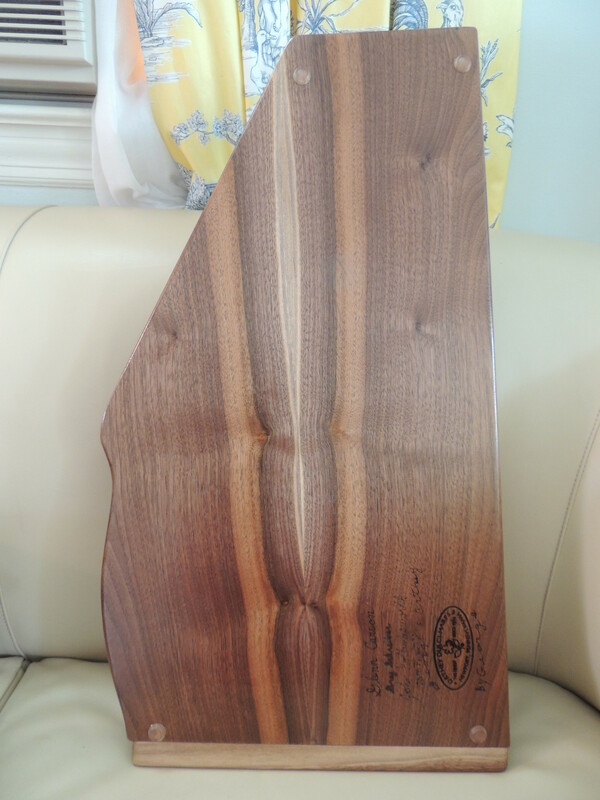 Greg Schreiber thought quickly and snapped this photo before applying the lacquer finish to the autoharp body. A rare opportunity! During my first free moment after the Championship, I called my husband at home and calmly greeted him (I was exhausted, and that head cold was bearing down): “Hi. I think you better sit down.” He said he would lay down on the couch, even better. Thanks to Robin, the caterer, for the comped pie and ice cream after the contest. I promised Diane, my campmate, that I would do my best to be a normal person in her presence amidst all the excitement. I’ve never been sure what “normal” is, but at least I would try to be that. As we had been preparing meals at the rig all week, the day after the contest I declared a feast day and took us out for breakfast in downtown Newport (the best poached eggs I’ve ever had) and dinner on the MLAG site, giving us time to converse informally with autoharping friends. Two of the judges made themselves known to me individually. They each said about my final-round tunes that they didn’t just hear the music, they felt it. Wow, they caught the God moment. Over the rest of the weekend, I found and praised those up-and-coming autoharpists whose playing I admired in the preliminary round. Imagine their surprise to be complimented by the Champion! Cheering them on is my job now. The state of the art needs to continue to grow and be challenged; who better to help it along? Bryan Bowers says that you must be able to play a tune perfectly three times in a row before you can claim that you really know it. 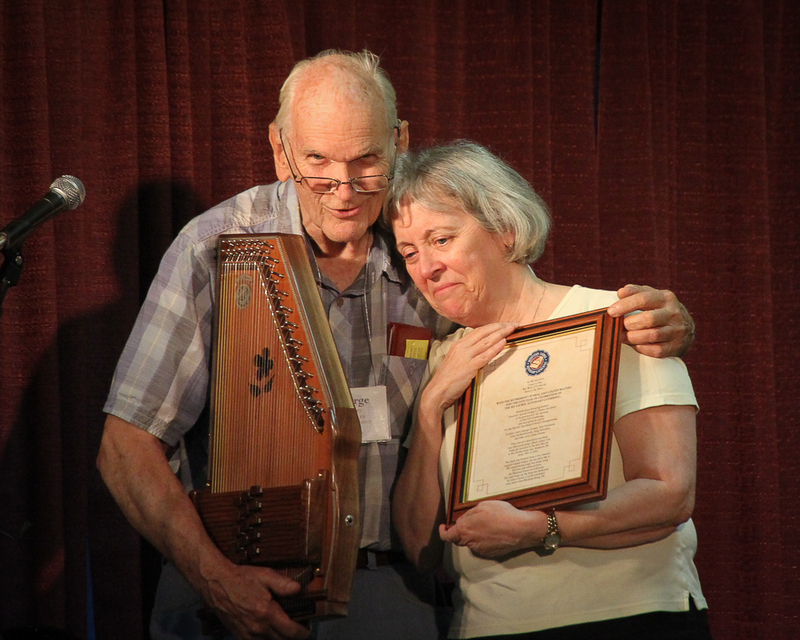 In that case, Lucille Reilly’s unprecedented third Mountain Laurel Autoharp Championship win is proof that she has gone well beyond “knowing it” to having all of us other players of the instrument acknowledge it, too – hence this poem. And joy in this poet’s heart. 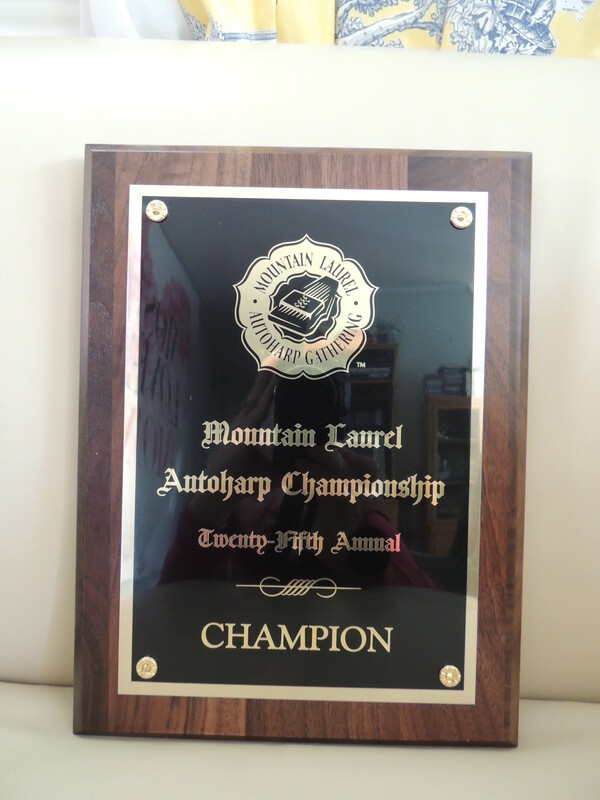 The first time I won the Mountain Laurel Autoharp Championship in 1995, I was happy. The second time in 2010, I was surprised. This third time in 2015 leaves me stunned! Will I compete again? There is no point! Three wins each of Mountain Laurel and the International are enough. (Frankly, I’d like to learn to play bluegrass banjo. But no banjo contests!) Mastery of the autoharp would seem to be evident. I have hung up my pre-contest heebie-jeebies for good, and will continue performing, teaching, coaching and writing with more passion. It is time to pass on to the community I love those between-the-ears gifts that live and breathe in my own music-making. 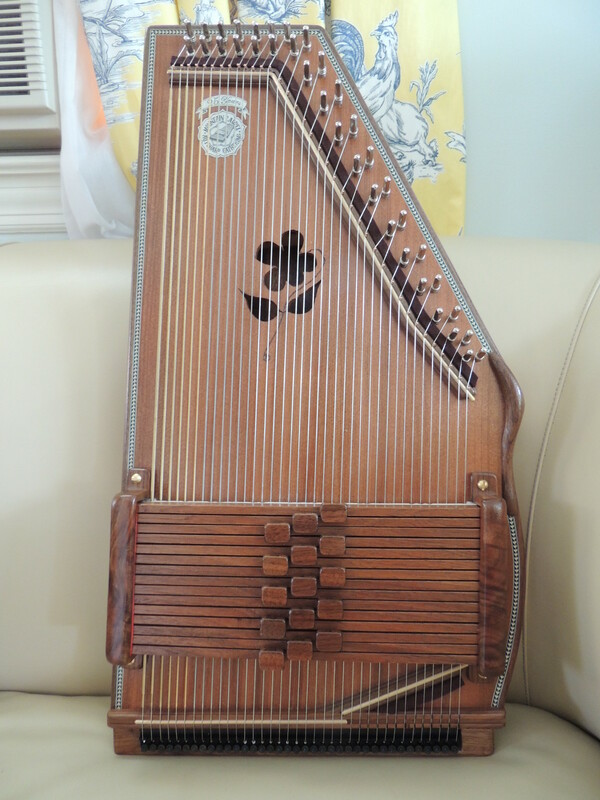 Together, I hope we will discover how to make every note, chord and lick count in ways that will inspire people to want to hear the autoharp again and again. B&B Lessons: what are they like? Beautifully written, Lucille. The next best thing to actually having been there. Your blog is so wonderful. Thank you for writing it. It brought tears to my eyes. What a privilege to count you as a friend. Hope you are feeling better. Just for the record, I often go to a jam that Glen Carson attends. Nice guy. I enjoyed your blog – thanks for sharing the experience with us. I loved your performance in the competition and also during the concerts and workshops during MLAG week. It was a pleasure to finally meet you and get to know you a bit. And, by the way, your Loose Ends workshop was one of my favorites this year. Looking forward to seeing you next year. Wonderful account of the contest! I wish that I would have been able to attend but my work schedule would not permit! I was watching the posts on Cyberpluckers to await the announcement and then got impatient and requested a status update. I was thrilled to learn that you were in the top five and then Kathy’s posting that you had won! I had prayed that God’s spirit would be with you during the competition and later when I saw the snippets of the contest that Niels posted, I could see His peace in your facial expression. Yes Soli Deo Gloria! I seriously hope that those who are headed to the contest arena will contact you for your coaching services. I know if I ever decide to take that stage, your coaching will be a part of my strategy. You have the gift of being able to release the soul of music through your autoharp and are able to express clearly to others about how to get there! Dr. Orthey’s autoharp is a treasured beauty! I’ve already ordered the contest CD’s from Coleen and can’t wait for them to arrive! From the snippets that have been posted it looks like it was an awesome contest! Congratulations to a well deserved win! Well done, dear friend of my youth (and middle age, and whatever the heck it is we’re in now). I am proud of you, of course: but maybe not for the reasons you’d imagine. For making beauty in a broken world and bringing healing? Yes, that, of course. For understanding the whole journey as a spiritual offering and a spiritual experience, a form of embodied prayer? Absolutely. For facing your fears by name, and never ever running away? Unquestionably. And for telling the story with honesty, real humility, and not a shred of false modesty? Gold star, honey. It’s all really this: “a thing of unspeeeeeeeakable beauty.” Higher praise than that, there is not. Well done, all round. “…a thing of unspeeeeeeeakable beauty” – Indeed! Beautifully written, Ceil. Your playing in that instrument never ceases to amaze, Lucille. “Fingers dancing on the strings” is a perfect way to describe what u have seen. Congratulations in another job well done! I couldn’t be happier. Ceil, this was a fascinating read. I’m not particularly familiar with the autoharp, and enjoyed learning about it. Also particularly enjoyed reading about your artistic process in developing your pieces for the competition. Such an artist. I watched the video from start to finish, and found myself whistling, and cheering aloud. Man o man, those competitors could play! I don’t have the technical no-how, but I sure enjoy good music. I remember when you were “just” the best hammered dulcimer player around, and started in on autoharp! Congratulations, congratulations, and more congratulations. And to think that now your considerable talents will be poured into teaching and coaching other people. I have loved being part of your journey and can’t wait to see what you do next.